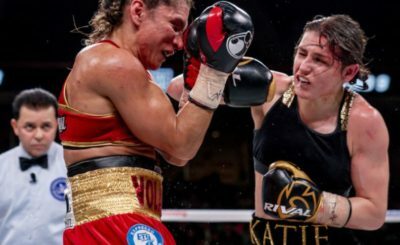 A date with destiny awaits Katie Taylor should she overcome the formidable challenge of WBO champion Rose Volante in Philadelphia tonight. Since turning professional in 2016, Taylor’s goal has been to become the undisputed lightweight champion of the world. 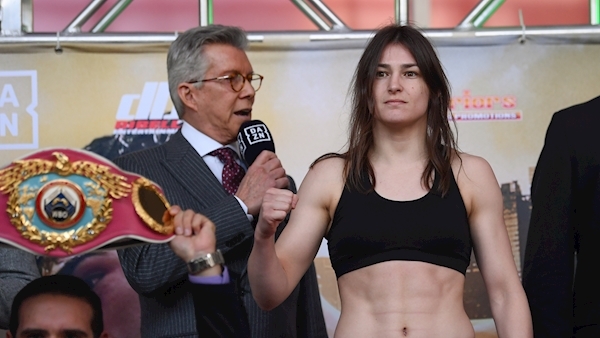 With the WBA and IBF belts already in her possession, securing the Brazilians strap will leave her three-quarters of the way to realising that dream — WBC champion Delfine Persoon the last potential stumbling block. The undefeated Volante will be no pushover and presents a physical threat Taylor has arguably yet to face. “Rose is a great champion. She’s strong and has a big right hand, she’s undefeated too so she’s a proud fighter and she’s chasing the same prize as me,” says Taylor. “We want each other’s belts and unbeaten records, but I have had a great camp and I am full of confidence. I think I am getting better and I think it will show on the night. This could be a very physical fight and I am prepared for that”. Taylor has taken the sport by storm since leaving the amateur ranks and 2019 looks set to be the greatest year of her career. 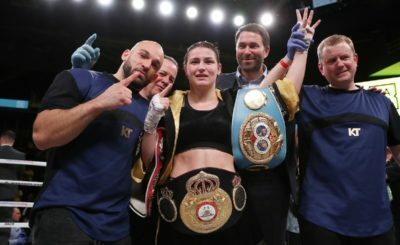 “Women’s boxing is flying right now and the reason for that, in my opinion, is Katie Taylor,” says promoter Eddie Hearn. Not only did she force women’s boxing into the Olympics but she also forced women’s boxing in front of the networks, the broadcasters, the sponsors, and the fans and showed them how entertaining women’s boxing can be. Should Taylor triumph tonight, all roads to unification culminate on the Anthony Joshua v Jarrell Miller card in Madison Square Garden on June 1 against Persoon. 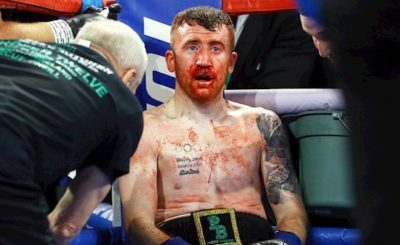 In the era of four major titles per weight division, no Irish fighter has held more than two simultaneously. If Taylor were to overcome Volante and Persoon, she would become the first Irish fighter ever to complete the feat. Such is Taylor’s ever increasing global appeal, even bigger money spinners await the 2012 Olympic gold medalist. A clash with Amanda Serrano, a world champion in seven weight divisions, is being touted as a headline act by itself in New York in the autumn, Taylor’s first potential unified title defence. Next up would be a mouth-watering superfight with undisputed welterweight champion Cecelia Braekhus in December; the first time in the modern era two undisputed champions would fight each other, male or female. “This could be a monumental year for me, the biggest of my career both amateur and pro,” says Taylor. “I believe that by the end of the year I can look back at being the undisputed lightweight champion and have had huge fights with Amanda and Cecilia. “They want those fights as well, but I have to keep winning and everyone raises their game when they fight me. While Taylor will be long odds-on for victory, the opposite is the case for Dublin’s Jono Carrol, who headlines tonight’s card in the 10,000-seater Liacouras Center. 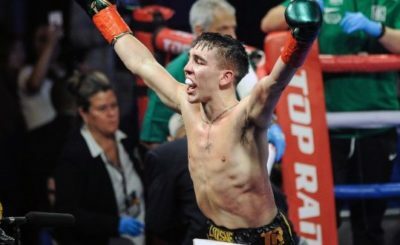 Carroll faces hometown favourite Tevin Farmer for the IBF world super-featherweight title — his first ever world title fight. It will be Farmer’s third title defence and the first in his home city following wins over Francisco Fonseca and Belfast’s James Tennyson. It may be the City of Brotherly Love but there has been little of that lost between the pair after two heated press conferences and some social media spats. However, the unbeaten 26-year-old views this test as his “Rocky” moment. 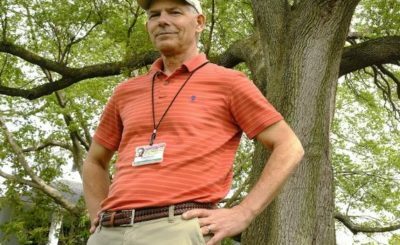 “This is a real Rocky story, I have been steadily climbing up the ranks,” says Carrol. “I have dedicated my life to the sport. From 15 on, it’s been boxing, I truly enjoy every minute. “I have really enjoyed my time in Philadelphia. I went to the Rocky steps and I have been taking it all in. I had an amazing camp, great sparring and no injuries thankfully. “Tevin has defended his title a couple of times in a row and I know he is going to be sharp. It’s a tough mountain to climb but I think I can do it”. Tonight’s card will be shown live on Sky Sports Action from 11pm in the UK and Ireland and on the subscription streaming service DAZN in the US. 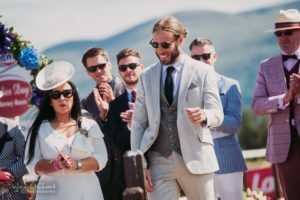 This article first appeared in the Irish Examiner on March 15th, 2019. To view the original version, click here.